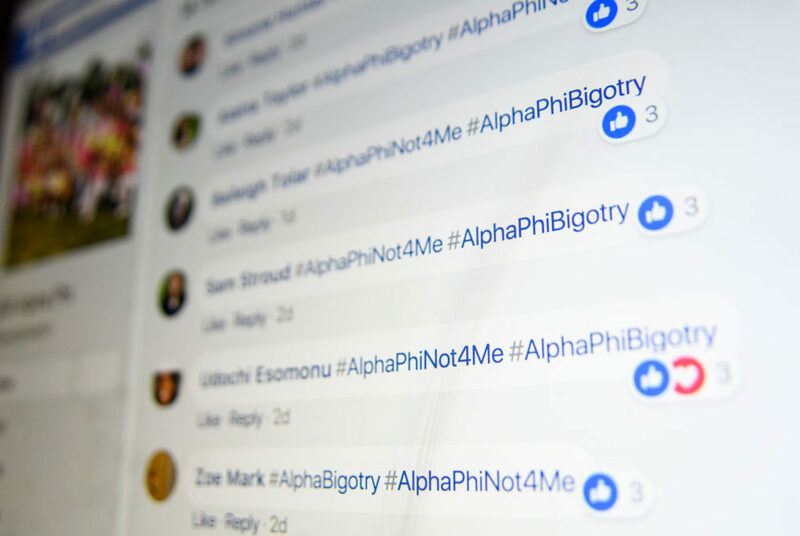 As the Snapchat spread, students took to social media to comment #AlphaPhiNot4Me and #AlphaPhiBigotry, hashtags that had been developed at an open forum last week. Over the last four days, the image of two sorority members and a banana peel has ignited a firestorm at GW. The photo, a Snapchat post, spread around campus Thursday morning featuring one member of Alpha Phi holding up a banana peel, with the caption, “Izzy: ‘I’m 1/16 black’” – a message that evoked a long history of racist taunts against the black community. The members involved in the photo have not been publicly identified. Since the photo appeared on social media, campus has been engulfed in an intense debate about race and the treatment of minority students. By Friday, GW’s Alpha Phi chapter said it would kick out the three members involved in the post – the two featured in the image and the third who took the photo. The controversy began late Wednesday when the photo began circulating on social media. By the next morning, it had been tweeted publicly to senior officials. The University responded to the tweets and vowed to “look into” what had happened. Student Association Sen. Imani Ross, U-at-large, who was one of the first students to ask the University to investigate the incident, said not exposing the Snapchat post publicly would have perpetuated a culture of complicity in racist behavior that alienates students of color. She said Alpha Phi’s entire chapter was culpable for the incident. The photo was posted on the Facebook group “Overheard at GW” at about 11 a.m., a post that has attracted nearly 800 reactions as of Sunday. As the controversy grew, the University responded with a statement from Provost Forrest Maltzman condemning the content of the image as “disturbing” and “hurtful.” He said this type of post makes some students feel unwelcome at GW. Greek organizations also weighed in. The Interfraternity Council condemned the post, which occurred during the IFC’s recruitment process. Other Panhel sororities, including Pi Beta Phi and Chi Omega, repudiated the post and their sister chapter, Alpha Phi. “We are uncomfortable being a part of a Greek community where these actions are accepted and not addressed in an appropriate and timely manner,” Chi Omega leaders wrote in a Facebook statement. By Thursday night, the incident was being covered on local television stations across the District. Amid the slew of apology statements from sororities, Julia Satin, the Student Association’s director of Greek affairs for Panhel who is also a member of Alpha Phi, resigned from her position in the SA. 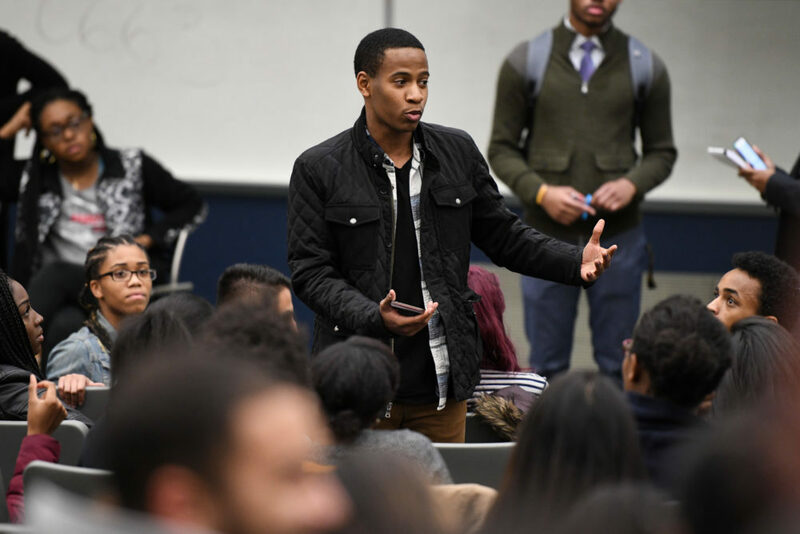 On Thursday night, the Black Heritage Celebration committee and the Black Student Union planned an open mic night in the Multicultural Student Services Center to talk through what happened and have a larger conversation about the struggles minority students face on campus. The event attracted an overflow crowd of more than 200 students and was moved to a larger lecture hall in Funger Hall. Freshman Owen Manning speaks at a community meeting on campus diversity in Funger Hall Thursday. Maltzman also attended the meeting along with Associate Dean of Students Tim Miller and other administrators, who vowed to take action but cautioned that a sorority could not be kicked off campus without an investigation. Panhel President Elizabeth Jessup, who attended the meeting, told members that improving diversity in Panhel chapters was among her top goals in the position. But rather than quell the controversy, the post only seemed to fan it. Black Women’s Forum said a suspension was “not enough when students of color regularly experience racism and discrimination on GW’s campus,” and students one-by-one commented #AlphaPhiNot4Me and #AlphaPhiBigotry, hashtags that had been developed at the open forum. The post was deleted about an hour later. The chapter came out with a new statement Friday, apologizing “without qualification,” saying its members in the photo showed “offensive and inexcusable behavior.” The three members involved were in the process of being thrown out of the sorority, according to the statement. On Saturday, the men’s basketball program, which has traditionally shied away from political or cultural statements, spoke out. Head coach Maurice Joseph said at a press conference that there was “no place” for the message in the photo at GW. The status of the investigation remains unclear. Alpha Phi’s international organization has not responded publicly to the incident. Both GW’s Alpha Phi chapter and its international organization have not returned multiple requests for comment since the incident. It’s unclear what University punishment the students could face. The student code of conduct bars discrimination on the basis of race, ethnicity, gender identity, age, disability or sexual orientation, but doesn’t mention acts that are offensive. 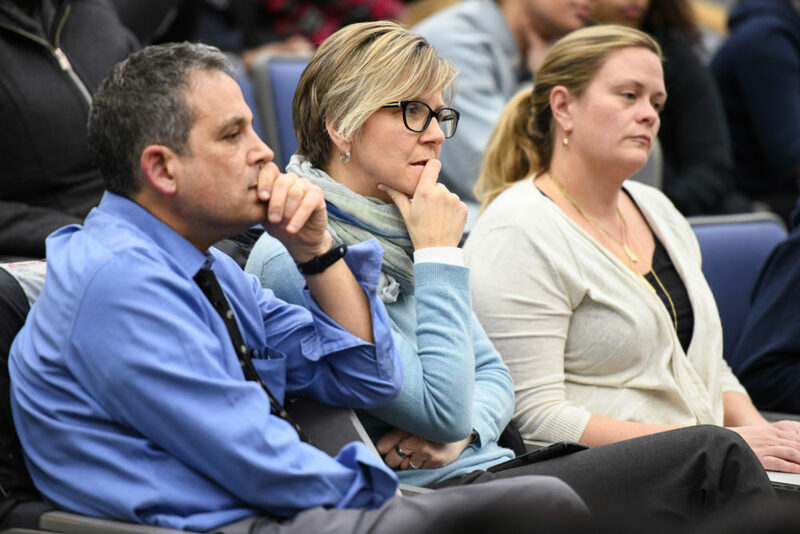 Provost Forrest Maltzman and Laurie Koehler, the vice provost for enrollment management and retention, listen to students voice concerns about campus diversity in Funger Hall Thursday. The controversy comes as Greek life has faced nationwide criticism for failing to address diversity concerns. Alpha Phi in particular has already been embroiled in national controversies this year. A member of its University of Alabama chapter posted an Instagram video last month containing racial slurs and was expelled from the University for her actions. Ross, the SA senator, said she was disappointed by the reaction from members of Alpha Phi and felt there was lack of communication between the chapter and students impacted by the post. She said even prior to the incident, Alpha Phi was known as an unwelcoming organization for minority students. Nikole Rodrigues, a senior who disafiliated from Alpha Phi her junior year, said the post “reaffirmed” why she originally decided to leave the chapter, which she said created a community that she felt “excluded” from as an ethnic minority. Rodrigues said when she initially joined the chapter, she was placed in a “lineage” group, a group of members that share a common trait, called the “ethnic phamily.” Although the group initially reflected her pride in being diverse, she said it created an obvious divide between racial minorities and white members of the sorority. “It essentially emphasized that even though the minorities were included, the ‘ethnic’ label separated all people who weren’t white, which is not a good thing,” Rodrigues said. Bailey Bystry, the vice president of Students Against Sexual Assault and former member of Alpha Phi, said in a Facebook post that when she saw the Snapchat photo, she “deeply regretted” not disaffiliating from the sorority almost two years ago when she was already doubting her membership in an “exclusive” organization. She said she asked to disaffiliate from the chapter after the incident. “If you, like me, believe institutions can’t be changed from the inside and your continued membership makes you complicit in a larger history and system, you need to disaffiliate now,” she wrote in the post. Arianna Dunham and Sarah Roach contributed reporting. This article appeared in the February 5, 2018 issue of the Hatchet.